The history of this place has some distinguishing features. They are embedded in history of Gdansk so much that the routes of trips for foreigners include one stop in Szeroka Street and the story of Goldwasser – vodka of Gdansk. A Dutch Mennonite, Ambrozy Vermollen, after he had been given the citizenship in Gdansk, founded a liqueur factory in Szeroka Street in 1598. The original name was ‚Der Lachs’ which in English means ‚Salmon’ (in Polish: ‚Łosoś’). This fish which symbolises happiness and prosperity has been a symbol put on all goods of the quality-control section. The most popular product was Goldwasser. The recipe for making herbal liqueur containing small flakes of 22 karat gold has been shrouded in mystery and passed down from one generation to another. 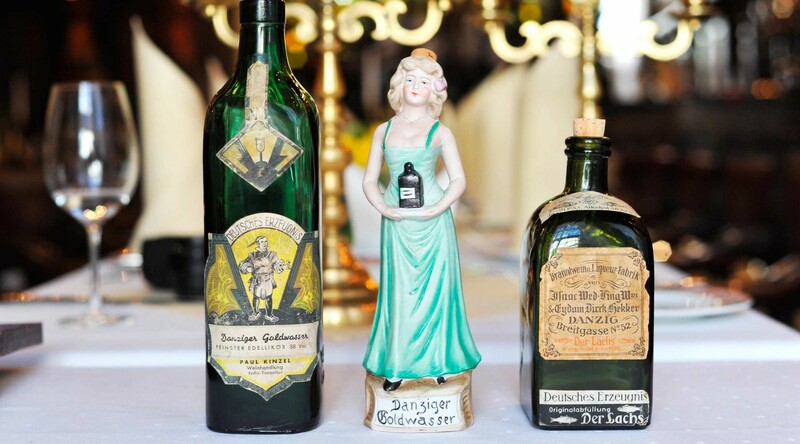 This liqueur as a branded article of Gdansk has been present on European royal courts and was one of the favourite liquors of the Empress Cathrine the Great. Bestvater, Henrichsdorf, Marwitz and Wundich dynasties were the next heirs of this recipe as the historical chronicles say. Nowadays, the real heir and owner of this recipe is Graf von Hardenberg, the owner of the Hardenberg-Wilthen AG liqueur factory in Germany. For many centuries the quality-control section and Pod Lososiem Restaurant have been famous places for their incredible valuables, picture and furniture collections. Unfortunately, World War II conflagration did not spare Szeroka Street. The tenement house was destroyed by bombing attack and the collections were gone. The Robakowski family have been running this place for more than 25 years since in 1976 Pod Lososiem Restaurant was re-opened.